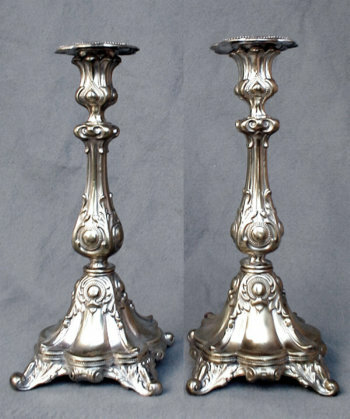 Beautiful Polish silver plated Sabbath candlesticks made in Warsaw. Marked "Galw. Warsaw Norblinis." Late 19th Century. Baluster stem rises from fluted and squared-footed base, delicately detailed with Acanthus leaf motif and prominent beaded bosses.